Doing nothing is perfectly acceptable on the 150-foot Safari Explorer luxury motor yacht. You don’t have to jump up for whale sightings or watch bottlenose dolphin ride the bow wave. 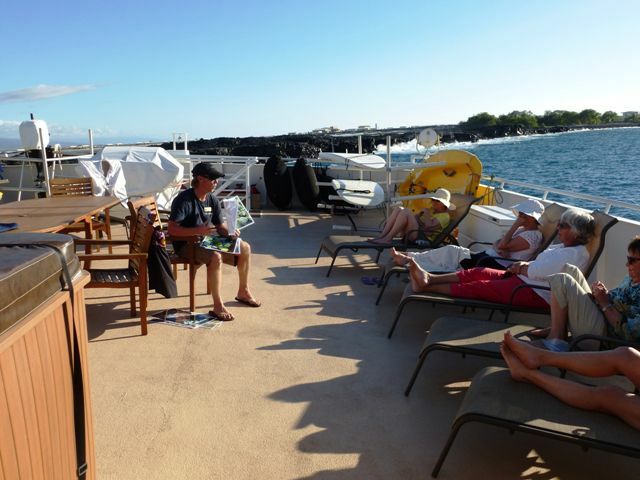 You can sit on the upper sundeck wrapped in Sky Father’s blue dome cooled by the sea breeze and enjoy your favorite book. Peering into the cobalt blue depths at the amazing adaptations of creatures living in the coral reefs is not mandatory. You certainly don’t have to partake in all the wonderful gastronomic delights placed before you three times a day. You can pass up the opportunity to snorkel above giant manta-ray that swim within inches of your body. That’s right! You don’t need to lift a pinkie on the Safari Explorer “Un-Cruise Adventure” designed to free you of all concerns, but why miss out on all that fun! Experienced, sensitive crew members helped those of us who might not be quite as fit as they once were to safely participate in water sports like kayaking, paddle boarding, and snorkeling. A 73-year-old woman on the trip who had never snorkeled was positioned on a boogie board and hand-held around Kealakekua Bay so she might see the colorful denizen in one of world’s top ten snorkel stops. 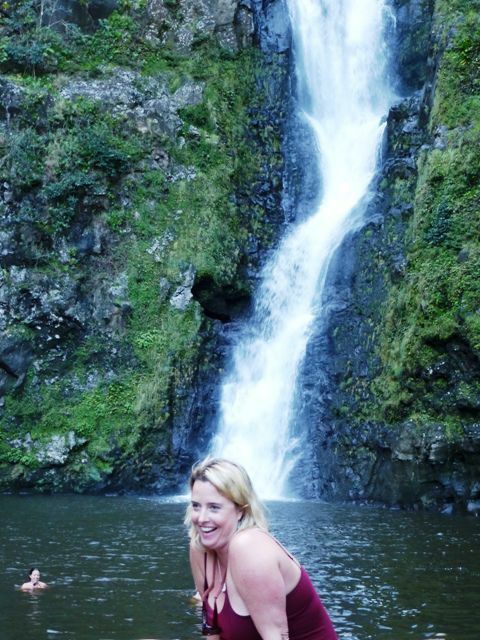 On the hike into Halawa Valley, home to the earliest Polynesian settlement in the Hawaiian Islands, our guides made it possible for everyone who wanted to make the hike up to a staggeringly beautiful, triple-tiered waterfall to do so. We trundled through the forest of giant mango ensconced in vines and birds nest ferns on a footpath trod by the ancients. On the way we passed a primitive birthing rock and rock walls framing the valley that was once the home to 3,000 early settlers. An invigorating swim in the pool below the falls got synapses snapping. The furious surf on the three-mile white sand beach on the west side of Moloka’i set my mind sailing. This long sweep of deep sand created by the ceaseless determination of waves rolling in from a 2,000-mile fetch is magnificent. This stop called for a picnic of poki (seasoned raw tuna) and pasta salads. That evening we were treated to an authentic cultural experience with sampling of local prawns, seaweed, lua pork, octopus and poi. Music provided by nose flutes and gourds accompanied a lovely Hawaiian woman who performed a graceful hula. At the end of each glorious sun-drenched day of explorations, I slept like a baby. 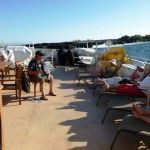 Lolling back and forth in my comfy bunk with the sway of the boat as we cruised to our next destination, I entered an embryonic state that gave new meaning to the word “cocooning.” Yoga each morning on the top deck kept me fresh for more adventures. A special treat was a night snorkel with manta rays. I had donned a wet suit and entered the water wearing a lighted bracelet to attract them to me. The moment I put my head under the surface an enormous gaping mouth came toward me then curled away exposing a white underbelly with black spots trailing behind a slender white tail. These gentle giants feed on plankton not people. They fly through the ocean spreading 15-foot wings, and as scary as they look, they will do you no harm. All outdoor activities are weather driven. One windy day we “skiffed” along the rugged black lava coast of the Big Island. Deep blue turned to aquamarine, then turquoise, and finally into a plumes of white spray shooting up hundreds of feet—Bellagio fountains Hawaii-style. The slick wet lava looked like obsidian in the sun. Just another spectacle to behold in Paradise! 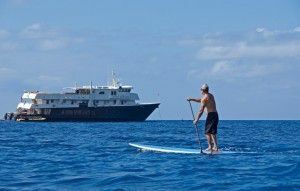 Our expedition leader, Brock, a resident of Maui involved and a man in love with whale research, taught all there was to know about whales. He swam with us, pointing out the wonders just beneath the surface of opaque water and heightened our snorkeling experience by sharing secrets of other creatures of the deep. Floating hotels that distance the traveler from their destinations are not for me. It took no effort at all to experience the Islands in a deep and intimate way on the Safari Explorer “Un-Cruise Adventure.” Truly a cruise I couldn’t refuse. This all-inclusive holiday is a great way to dodge the flocks of snowbirds that migrate to the Islands each winter. A more active and affordable option is offered in November. Go to “Un-Cruise Adventures” for details on this, as well as Inside Passage and Sea of Cortez sailings.